It has been over 40 years since Star Wars took the country by a storm and forever changed the way that movies are made. The franchise has grown even stronger in the decades since, and it will only continue to grow. I am lucky enough to have been a die hard fan since the beginning, and I have passed my love for all things Star Wars on to my daughter. This is indeed an exciting time to be a Star Wars and Walt Disney World fan. A new all inclusive Star Wars themed resort is in the works, and in 2019 Star Wars: Galaxy’s Edge will open at Disney’s Hollywood Studios. That doesn’t mean that Star Wars fans should wait to head to Central Florida, in fact the opposite is true. Here are ten experiences that will keep die hard Star Wars fans happy until 2019 rolls around. Unless otherwise noted, they are at Disney’s Hollywood Studios. Star Wars fans need to eat, and Backlot Express makes dining fun. Choices include such items as Dark Side Chicken and Waffles and Royal Guard Burger. You can also get an All-Beef Hot Dog, but where’s the merriment in that? There are a few other entrees available as well. Even if you don’t order a meal at Backlot Express, you need to stop by for a cupcake. Both the Darth Vader Cupcake and the BB-8 Cupcake are sold here. Order one of each so that you can take a bite out of both sides of the Force. Most Star Wars fans know that buying stuff that is somehow associated with the saga is important. At Walt Disney World, you’re covered. At Disney’s Hollywood Studios you can purchase anything from T-shirts to artwork in several different places. You can also build your own lightsaber or droid. At Disney Springs, you’ll want to stop by Star Wars Galactic Outpost and Star Wars Trading Post. You’ll find apparel, collectibles, and more. These aren’t the only places where you’ll find Star Wars merchandise at Walt Disney World, you won’t have to go too far to add something to your collection. At the moment, there is no daily parade at Disney’s Hollywood Studios. That does not stop people from lining up along Hollywood Boulevard! They are waiting for March of the First Order. Captain Phasma leads her squadron of stormtroopers to the Center Stage several times a day. March of the First Order doesn’t last long, but it’s impressive. Star Wars fans will want to have their cameras ready. Center Stage is also where Star Wars: A Galaxy Far, Far Away takes place. The live show features several characters from the movies. A different type of show takes place daily on the stage next to Star Tours – The Adventures Continue. Jedi Training: Trials of the Temple allows Padawans ages 4-12 to learn the ways of the Force from a Jedi Master, and then battle a Star Wars villain. The show is fun to watch. The children will range from die hard Star Wars fans themselves to shy younglings who would rather be elsewhere. If your kids want to participate, take them to the Indiana Jones Adventure Outpost as soon as the park opens. Spots fill up quickly, and your child must be with you in order to get on the list. This one is bittersweet. Star Wars: Galactic Nights is a special ticketed event where guests can do many of the things that used to be included for free with Star Wars Weekends. Star Wars: Galactic Nights features extra characters, merchandise, special themed foods, and many surprises. In 2017 Star Wars: Galactic Nights has been offered twice. The first time was during Star Wars Celebration, which took place in April at the Orange County Convention Center. The second opportunity for Star Wars: Galactic Nights has been timed in conjunction with the opening of Star Wars: The Last Jedi. There is no word on whether or not it will be offered in the future, but with more movies on the way there is a good chance that it will return. Star Wars Launch Bay is part museum, part interaction, and part store. You can see replicas of ships, costumes, models, and more from the Star Wars movies. Explore at your own pace. There’s a ten minute behind the scenes film that you can watch if you’d like. There are three popular character greetings inside; Chewbacca, Kylo Ren, and BB-8. Launch Bay Cargo is where you can make a cell phone case, purchase autographed photos, and even buy a high quality Darth Vader costume. Take your time as you explore Star Wars Launch Bay. There is a lot to see, and unlike Dagobah, it’s air conditioned. 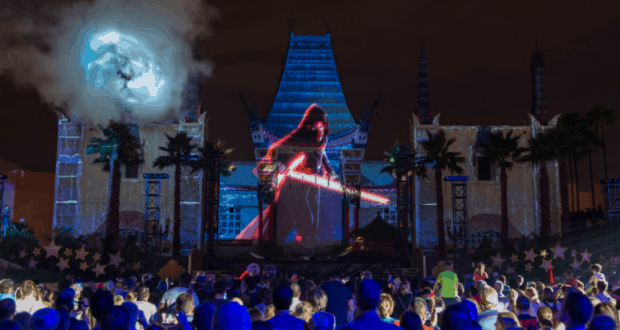 If you’re a die hard Star Wars fan and you are worried that you are going to miss something at Disney’s Hollywood Studios, you might want to consider signing up for the Star Wars Guided Tour. You’ll be able to watch the shows, walk through Star Wars Launch Bay, enjoy a meal at Backlot Express, get some great character pictures, guarantee a spot for your younglings in Jedi Training: Trials of the Temple, blast off to a galaxy far, far away on Star Tours – The Adventures Continue, and more. Your day will end in a reserved viewing area for Star Wars: A Galactic Spectacular. For more information on the Star Wars Guided Tour, call 407-939-7529. The perfect way to end your day at Disney’s Hollywood Studios is with Star Wars: A Galactic Spectacular. You don’t have to be a Star Wars fan to enjoy the show, but if you are you will relish every moment. Scenes from the movies are shown on the replica of Graumans Chinese Theatre, which is perfect since the original is where Star Wars debuted in 1977. There are fireworks, fantastic laser effects, and plenty of surprises. The classic score by the legendary John Williams adds to the show’s perfection. Star Wars: A Galactic Spectacular is a must-do for every Star Wars fan. Ever dream of being able to truly step inside the Star Wars universe and be totally surrounded by it? Would you like to be part of a mission at the same time? You can do exactly that at Disney Springs! Star Wars: Secrets of the Empire by ILMxLAB and The VOID (also known as Secrets of the Empire or The VOID) allows teams of four to visit a galaxy far, far away in ways that you never dreamed possible. You will encounter stormtroopers and others as you try to capture intelligence for the Rebellion. Tickets are available for the 30 minute experience. Visit thevoid.com to purchase yours. Star Tours – The Adventures Continue is the best way to combine your love for Star Wars and Walt Disney World. Your pilot is C-3PO, what could possibly go wrong? You’ll start your journey with a visit from either Darth Vader or a group of stormtroopers who are looking for a rebel spy…is it you? From there, you’ll visit two different planets, and have an encounter with a hero of the Rebellion. The best part of all is that each ride is unique, because there are several sequences. Currently there are seven different planets that you might encounter, but a new one is set to be added with the release of Star Wars: The Last Jedi. The beauty of Star Tours is that it is easy to add more worlds as the franchise continues to grow. Die hard Star Wars fans will want to ride it over and over again.